This is Part 2 of my journey in networked hi-fi. Part One is here. I realised the real benefit to me of streaming audio when I managed to stream music files from the PC in my study to the Hi-Fi in my living room, home of the best stereo. To set this up, using the I-East Soundstream, required setting the PC up as a server. This is not mentioned in the Soundstream instructions and sounds complicated but is, in fact, pretty straightforward. The simplest way for Microsoft PCs is probably to use Windows Media Player (“WMP”). That is much improved from earlier versions and would have done the job were it not for the way my music collection is structured. I keep my music in a folder hierarchy structured by genre and artist. This is fine for scrupulously indexed collections using only MP3 or other, easily tagged files. WMP however expects to see properly up to date and consistent metadata and so I had trouble seeing my music in the way I am used to. I normally use Foobar 2000 as the music player and manager software because it has always supported lossless files, works well with multiple output drivers and copes with my filing system. The basic capabilities of this programme can be extended by adding further modules, called, unsurprisingly, “extensions”. There is an extension which turns Foobar into a server, allowing its library to be visible to and accessed by audio players or other devices on the same local network. So, I downloaded and installed the extension, relaunched the software and it was good to go. This worked fine at first and I spent several happy hours playing on my Hi-Fi music which was stored on my computer and selected and controlled through the app on my iPad. I really felt I was getting somewhere! Then, after my initial success, I found that I would switch into the iPad app, expecting to see and be able to play from the Foobar library only to find it had disappeared. At this stage I realised how complex fault finding can be in a system with so many points of potential failure. After repeatedly rebooting the computer (which sometimes solved the problem), changing out routers and trying different iPad apps I finally tried using MediaMonkey instead of Foobar as the server on the PC. MediaMonkey has server capability built in, which just needs switching on in the “options” screen. This solved the problem and has been serving music to the network reliably ever since. The downside of this system is that it requires leaving the PC switched on all the time if I want to listen to the music stored on its hard drives. In an ideal world I could have overcome this by connecting the hard drive to a USB port on the Wi-Fi router which look as to be designed to do this. If it works this allows the drive to be accessed permanently as “Network Attached Storage”. I found however that, despite appearances, the “BT Smart Hub” is not actually equipped to do this and my other router, a TP Link Archer VR600, did work but would only serve up the first couple of folders on the hard drive. So, after a few more wasted hours of research and experimentation I gave up on this option. Despite my disappointment with the routers, with MediaMonkey running on the PC and using the i-East software on the iPad I had a well-functioning system. So, it was time to play some more! This type of networking uses a couple of protocols to allow compatibility between devices. The main ones of these are DLNA and UPNP. Reflecting this standardisation, the Apple and Google app stores have quite a selection of software players with network capabilities which can be used as an alternative to the hardware manufacturers’ own. These all offer slightly different capabilities (many are more focused on streaming video to TVs) and different levels of integration with online music services. After trying several, I settled on a couple that work well with my setup and are worth trying if you’re exploring this area. The most interesting is an iPad app called “Creation 5”. This was originally developed for Bang and Olufsen so is professionally designed and audio focused. The app integrates the online music service Deezer and a selection of Internet radio stations. The most flexible software I found is called MConnect. This allows you to play music from your own library server in the same interface as Tidal and Qobuz, or to stream from Dropbox or OneDrive cloud services. I’ve not tested the cloud service integration but it is properly audio focused and works very well with my server library and with Qobuz.I didn't test with Tidal but it should work the same. Spotify “sees” the streaming devices in its own interface and can direct its music to them within its own software environment. It is worth noting however that none of the solutions I’ve found enable gapless playback. Even where this is possible in software, it’s not been supported in hardware and I understand it’s not part of the DLNA protocol. It is seldom an issue for me but some people will find it very irritating. 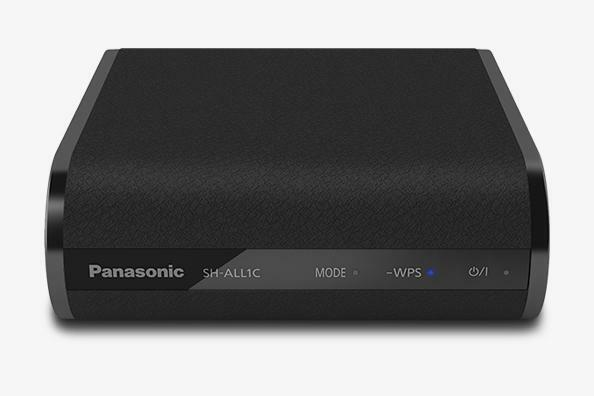 Looking for a means of streaming higher resolution tracks to my DAC I came across a deal on a Panasonic SH-ALL1C. Listed at £199, a local store had an “open box” unit (which had been returned by a customer) for under £50. Again, this unit had mixed consumer reviews on the major websites but these mostly concerned issues that I’d managed to resolve with the Soundstream. The ALL1C has similar capabilities and connections to the Soundstream but is, in most respects, a higher quality piece of equipment. It is part of a range seemingly intended as a competitor to Sonos, mostly consisting of powered, networked loudspeakers. But since it uses similar networking protocols this speakerless networking unit fits the bill very well. Physically, it’s larger than the Soundstream, about the same size as a thick paperback book. The power supply is integrated, connected by a figure of eight power cable rather than the "wall wart" connection of the Soundstream. It has an optical SPDIF output which can be switched between a standard and higher resolution data streams. In the “standard” setting, higher data rates are reduced to 44kHz (presumably to allow for widest compatibility). Higher rates are accessible by changing the mode, which involves using touch sensitive buttons on the front. There is less of a need, however, to use the optical output as the integrated DAC produces a very respectable sound from its phono outputs. It’s not as good as the Marantz, lacking the weight and spacious imaging which that delivers, but for the price I paid it’s exceptional. 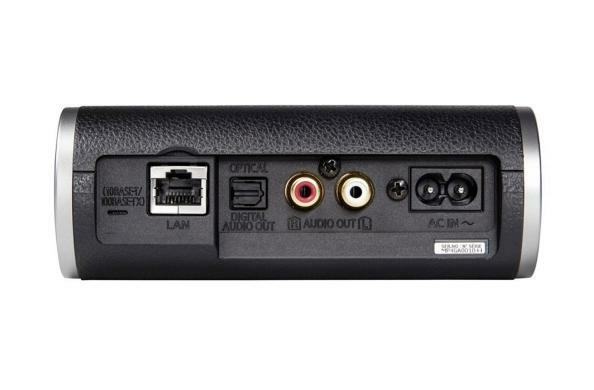 Even at the original price it would probably be competitive, but its lack of physical inputs mean it can’t be used as a stand-alone DAC, unless a user wanted to use only streaming audio. Whilst this doesn’t apply to me, I could imagine a student or other small room dweller using such a unit in conjunction with a laptop, a cheap digital amplifier, some high sensitivity speakers and a high quality Spotify (or similar) subscription as a low cost way to put together a good sounding system connected to a virtually infinite library. After installing the Panasonic, I moved the Soundstream to another room to give streaming capability there as well. In theory, it’s possible for me now to direct audio to either or both Hi-Fi’s, served either by the music on my PC hard drive or from Spotify (my regular Internet music source) or Qobuz, that I have been auditioning again. I’m not sure that, personally, I can justify the outlay for Qobuz’s highest resolution service but I can report that it sounds fantastic streamed through the Panasonic streamer, converted by the Marantz DAC. In the short time I’ve had it working, it’s become my main listening set up, especially as I’ve been researching music for various projects and have so appreciated the range of music available at high quality online. It has been a bit of a struggle to get the various elements of my networked audio system working well together but for me it has been worth the effort. I’m blessed with having the time to play with units and use trial and error to get them working as I want. I have talked here about the hardware and software I’ve come across on my journey. There are plenty of others I’ve not tried so I’m not putting this forward as the best available at the price or anything like that - YMMV as the saying goes. But I can say conclusively that networking offers an array of possibilities that, in a successful implementation, offers a great way to play high fidelity music – which is really what our hobby is all about. That it can be done so economically makes it appealing to a wide audience as well.